Upon arriving at The Ainsworth for Commencement on Thursday, I was filled with highly conflicting emotions. As I stepped foot through the door, I immediately had a flashback to an event seven weeks prior: MSBA’s Kickoff Celebration on Day 3 of the program, which would soon change my life both personally and professionally. Day 3 feels like yesterday; I remember anxiously waiting to meet my Mentorship Collective for the first time while still trying to build relationships with the 24 individuals in my class who I had just met two days earlier. When Lorne and Bailey revealed each participant’s Collective to them, Jasmine McGee (Excel Sports Management), Zach Wang (Jet.com), and Molly Rauhauser (CSM Sport & Entertainment) all seemed so similar to me on paper, but I never could have imagined the impact that they would have on me in eight short weeks. Just 50 days ago, my classmates and I were strangers, but here we were now, gathered in the same room as a family for the last time as active members of the MSBA Class of 2018. I have been trying my best not to think of August 4th, the day we’d all be moving out and I would be leaving my newfound family behind. Last week, we visited five powerhouse companies and met some of the best and brightest minds in the sports industry at the National Basketball Players Association, Bleacher Report, the National Football League, National Hockey League, and Madison Square Garden. However, Commencement was the most special MSBA event of the summer because we were surrounded by the best company yet. Gathered in the room was each participant’s support system, including families, Mentors, Internship Providers, and the MSBA Staff, each of whom contributed to one or (many times) more participants’ personal and professional growth this summer and continues to set the example for how to achieve success in the sports industry. 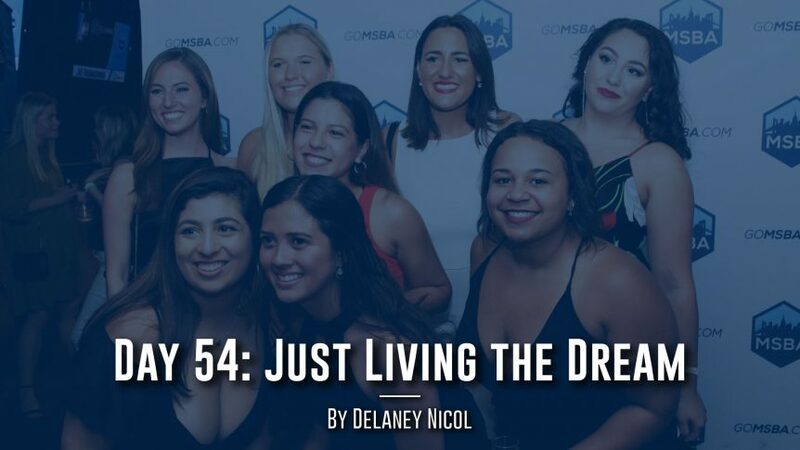 MSBA’s mission of identifying, preparing, and connecting the next generation of sports business leaders would not be possible without every individual congregated together that night. While everyone was enjoying Commencement, Lorne paused the chatter momentarily to give a short speech, deliver his closing remarks for the summer, and propose a toast to the best summer of 25 individuals’ lives. Following the toast, everyone directed his or her attention to the television monitors where a congratulatory reminiscence video was being broadcasted. Singing along to the video soundtrack with Bailey Weigel, someone who I have admired from the beginning of MSBA for too many reasons to name, my emotions were running high (not quite as high as Matt “Slim Shazy” Schasel, who began to cry REAL tears) as I looked back on the experiences I was blessed with this summer. The crazy thing is that, although this video perfectly conveyed the story of our unsurpassable MSBA summer (S/O to John Regula for being the best creative producer that MSBA has had or will ever have), the true MSBA experience cannot be captured through a video. The sentiments behind one’s greatest moments in life can never be truly felt unless they’re lived, and the same goes for this summer. Before being accepted to MSBA, I read all of these blog posts and viewed the content on each of the social platforms, but the truth is that you have to be part of the experience in order to truly understand the story. As the video concluded, this is when it really hit me – it was over. The dream that I had been living out for the past eight weeks was coming to an end, and the transcendent moments that I experienced through this program were ones I would never get back … or so I thought. In speaking with David Oestreicher (Co-Founder of MSBA and my most influential mentor of this summer), I gushed about my uneasiness regarding the summer ending because I felt as if I was putting my career and all that MSBA has taught me on pause to finish my final year of college. However, David explained to me that this so-called “pause” does not exist. The invaluable relationships and lessons learned in MSBA are ones that I will take with me for the rest of my life. A lot of times when people think of Commencement, they envision one chapter of their life closing and another one opening. I now understand that the MSBA chapter in each of our lives will never close, and continue to open new doors in our future. No matter what path we decide to take in our careers, we will always have MSBA to thank for how we got there. Although the places we’ve visited and the sports business professionals we’ve met this summer are the highest caliber in the industry, what I’ll miss most about MSBA are the 26 other individuals that Lorne, Bailey, and David surrounded me with this summer. More than anything, I’ll miss the nights at the pier, impromptu brunches, trips to Yummy City and the Bagel Shop, late night 99¢ Pizza, Sunday night sunsets in Central Park, Zinger’s mixtapes, getting dunked on by my second roommates in 832, weekends at the lake, sleepovers with anyone who has a mattress topper, and asking Amazon’s Alexa to “Play Tequila by Dan and Shay” repeatedly while singing along with my amazing roommate and one of my closest friends, Anika “Alexa Asingh Derulo” Singh. I’ve never really been good at goodbyes, but luckily for myself and the other 26 individuals involved in the MSBA family, this is only the end of the beginning. This program has been one of the most important personal milestones of my life. To MSBA 2019: You all don’t know it yet, but you guys are the luckiest individuals in the world, and Lorne, Bailey, and David are about to change your lives – take full advantage and lean on them, as they’re the people who will make more of an impact on your personal and professional lives than anyone you will meet. To MSBA 2018: Thank you. Thank you for riding with me on this exhausting, yet insanely rewarding journey. Always remember Bob Proctor’s mantra: “It doesn’t matter where you are, you are nowhere compared to where you can go.” We’re just getting started.